The various custom-built PLD systems available consist of vacuum deposition chambers with pulsed lasers such as 248 nm KrF excimer, 1064 nm (532 nm) Nd:YAG, and 10.6 µm CO2 lasers. The vacuum systems are capable of sub-microtorr background pressures which can be back filled with inert or reactive gasses, as required. A multi-target changer is available allowing in-situ deposition of multi-layers with clean interfaces. An intensified charge-coupled detector (ICCD) imaging system aligned perpendicular to the plume propagation enables two-dimensional imaging and spectroscopic analysis of the laser-induced plume, allowing in-situ monitoring of the process. A patented dual-laser ablation technique developed at LAMSAT overcomes several drawbacks inherent to conventional single laser ablation and leads to the growth of more uniform, high density, particulate-free thin films. It is a unique process for high-quality film growth, especially thin films of multi-component materials. This method combines the outputs of excimer laser (UV) and CO2 laser (IR) pulses on the ablation target. Lasers arrive at the target with an inter-pulse delay that is determined based on the physical properties of the target material. Under optimum conditions the plasma plume of the ablated target material is highly energetic, close to 70% ionized, and contains very few particulates that are abundant in conventional laser-ablated films. Formation of nanoparticles of most of the functional oxides requires high processing temperatures. A near-atmospheric pressure plasma reactor with gas temperatures in the range of few hundred to few thousand degrees has been developed to form stoichiometric nanoparticles from aerosols of a precursor injected into the plasma. High temperature of the plasma results in solvent evaporation from the aerosol droplets and chemical reactions to occur within the resulting particles, while the temperature is low enough not to evaporate the particles. The custom-built system includes waveguide microwave power delivery subsystem, plasma chamber, and computer-controlled process monitoring. Plasma temperature is measured by optical emission spectroscopy. LASP was developed at LAMSAT to deposit nanoparticles of multicomponent materials with controlled particle sizes and to form coatings of chemically synthesized quantum dots on a substrate. Precursors that contain the salts in the same stoichiometric ratios of the desired nanoparticle material are nebulized and injected into a growth chamber using SF6 carrier gas. A CW CO2 laser heats the SF6 gas which in turn heats the aerosol to evaporate the solvent. Changing the precursor concentration is utilized to control the resulting size of the nanoparticles. Alternatively, precursors containing passivated nanoparticles can also be used in this system to deposit a coating of surfactant-free nanoparticles. This custom-designed system was developed at LAMSAT. 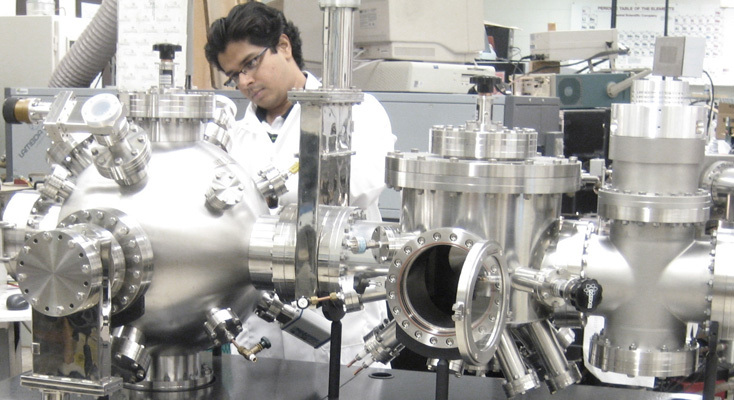 The state-of-the-art multi-technique deposition system incorporates: pulsed single and dual-laser deposition, microwave plasma-assisted spray deposition, thermal evaporation, and ion-beam etching. This system enables the integration of thin-films, nanoparticles, and nanostructures in a single growth cycle. In-situ patterning and optical diagnostics are also incorporated into the system. The chemical vapor deposition (CVD) system is utilized for the synthesis of carbon nanotubes (CNTs) via the breakdown of Ethylene gas (C2H4). Both single-wall and multi-wall CNTs are grown with this system. Chemical processing of alumina templates allows for the extraction of multi-wall nanotubes, while Ni-seeded growth leads to single-wall nanotubes.